*2.Using a vegetable peeler, remove the skins of your quinces, cut into quarters and remove the core and place in a large bowl of acidulated water. *3. Bakes uncovered 2 hour until golden-brown, tossing the quinces in the liquid once or twice during baking. The quince should be fork-tender, if not, then bake longer. *4. 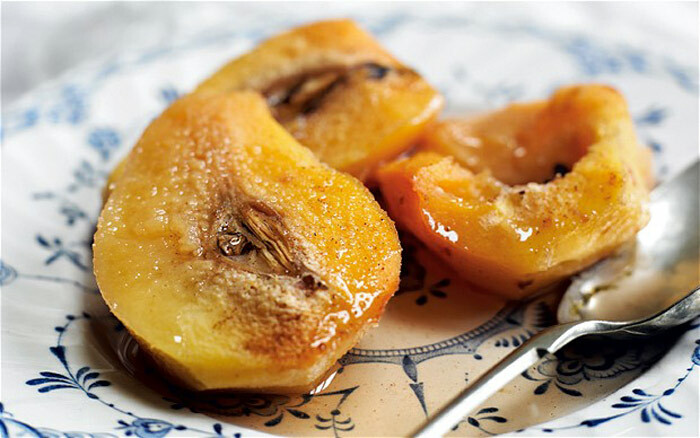 Serve warm with a big scoop of French Vanilla ice cream or strained Greek yogurt, with a topping of 2-3 wedges of quince and spoon over some of the syrup.